Royal Caribbean International announced this evening in New York City its next vision of dining at sea with what it called Dynamic Dining aboard the Quantum and Anthem of the Seas. The new ships will feature 18 restaurant concepts, including five complimentary main restaurants, as well as a new reservation system. According to Royal Caribbean, Dynamic Dining reinvents the traditional main dining room with five complimentary, full-service restaurants, each with its distinctive cuisine and ambiance. The American Icon Grill was described as a classic American road trip, with regional favorites and comfort-style menu; Chic offers contemporary cuisine; Silk features a Pan-Asian menu; The Grande was said to be a nod to the trans-Atlantic lines, offering classic and timeless dishes in a formal setting; and the Coastal Kitchen will fuse Mediterranean influences with California farmlands. 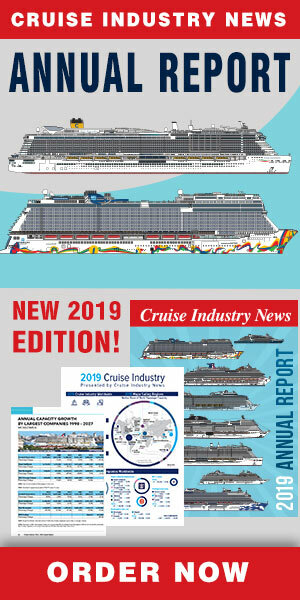 The press release also said that the Coastal Kitchen will be exclusively for suite guests, thus reducing the options for the most passengers to four, and not five, main dining rooms. But most passengers will not have an issue with dining options as Royal promised to take specialty dining to the next level as well. Britains’ Jaime Oliver is partnering with Royal in Jamie’s Italian restaurant. Other options include Wonderland, promising a dreamscape of never-before-seen fare; Michael’s Genuine Pub and the Devinly Decadent at Solarium Bistro (by Devin Alexander). In addition, versions of Royal Caribbean’s favorites such as the Chops Grille steakhouse, Izumi Japanese Cuisine and Chef’s Table will be revamped for the Quantum class. So-called laid-back options include the Windjammer Marketplace (buffet, self-service); The Café @Two70s, and the SeaPlex Dog House, as well as Sorrrento’s, Café Promenade and Johnny Rockets.